There are SO MANY great products on the retiring list! It's always sad to see our favorites go, but there are so many wonderful things coming! For today's Third Thursdays blog hop, we are giving a fond farewell to our favorite, well used products! My card today has more than one product I am giving a tearful farewell to! 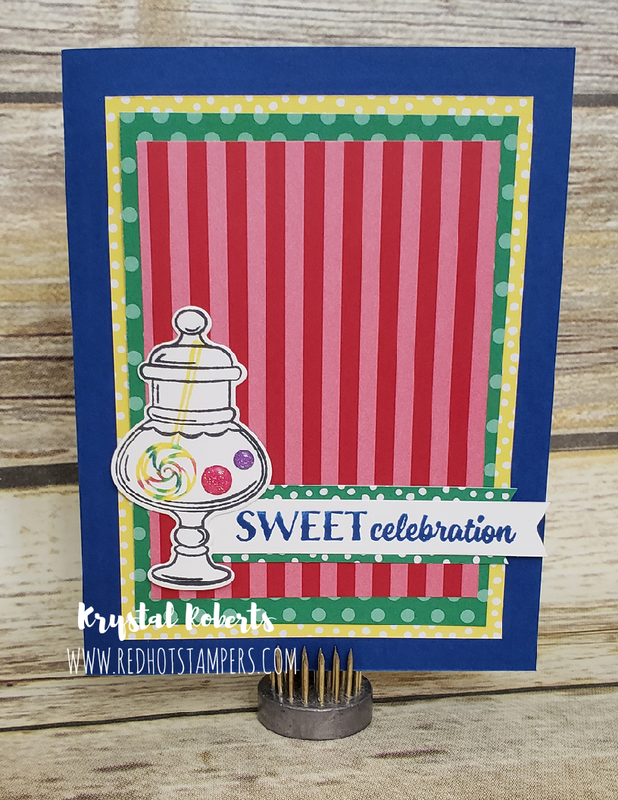 The Sweetest Thing stamp set and dies, as well as the 2018-2020 in-color DSP stacks! I wanted to do something a little less purple and pink for a more versatile birthday card, and immediately turned to those beautiful bright in-colors! Don't worry, they aren't leaving us yet! We get another year with them - THANK GOODNESS!!! But the Designer Series Paper Stacks are changing! We're saying goodbye to those beautiful stripes and polka dots! *sniff sniff* So sad! They are so versatile! I use them on EVERYTHING! The bright colors reminded me of those swirl lollipops, and the stripes were just perfect for a candy shoppe! 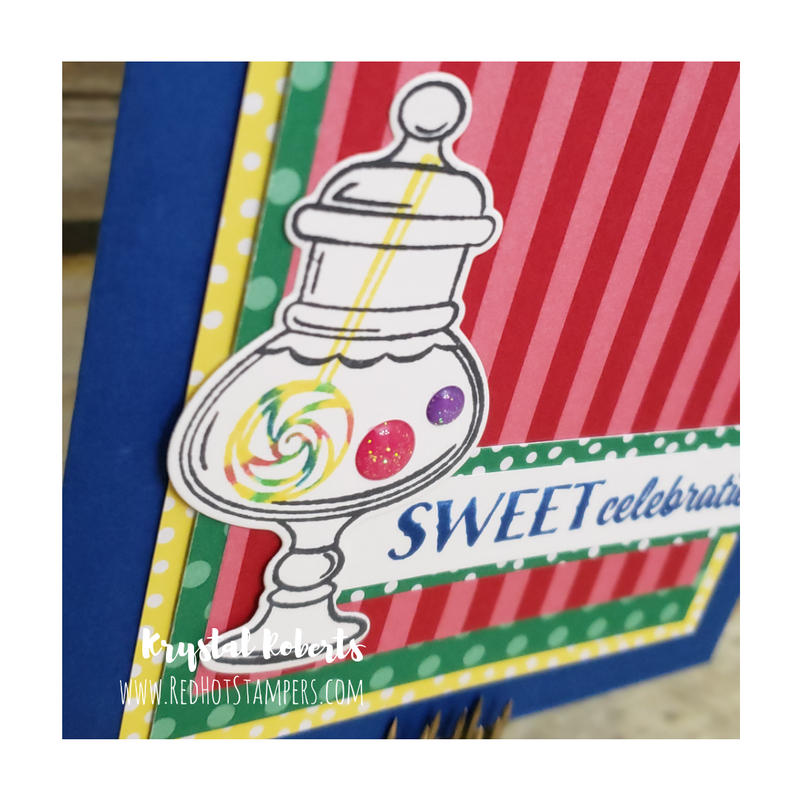 So, using the soon to be retired Sweetest Thing stamp set, I made my own swirl pop by stamping in Pineapple Punch and then drawing a stripe with the in-color Stampin' Write Markers from the center out. I love the way it turned out! It looks delicious enough to eat! I also shortened the sentiment to fit on the card front, and I DO believe it will make for a very sweet celebration indeed! This class includes instructions and videos for 4 over the top cards! If you haven't bought the Sweetest Thing Bundle & Paper yet, DON'T MISS OUT! It won't be returning for the new catalog coming out on June 3rd! Get them now while supplies last! The stamps are guaranteed through May 24th, but the dies may sell out before then! Order now by clicking on the table further down in the post or contact me for purchasing the supplies as well as the class kit for additional savings! Includes supply lists, measurements and video instructions for all the projects. If you already have the stamps and dies and don't mind cutting your own cardstock, this is for you! Includes supply lists, measurements and video instructions AND pre-cut supplies for all 4 projects. You will need the Sweetest Thing Stamp Set, Birthday Backgrounds Stamp Set and Time to Celebrate Stamp Set as well as a black ink pad of your choice. I am also showing you a technique using ink refills, but you can use ink pads or Stampin' Write Markers for a different look. See the recommended colors below. If you have the products but would love to have someone else do all the cutting, die cutting, scoring etc. This is the option for you! If you are interested in joining my team, please contact me or click here. If you want (need) any of the products, you can order by clicking on the images in this table and add them to your cart. Use the hostess code 6GX4KFPA when you check out and I will send you the Make & Take packet FREE with your order of $50 or more. If you order $150 or more, do not use the hostess code, but instead add $15+ of free product to your order! I will still send you the packet for free!